The bathroom today is getting more attention than ever from homeowners as they realize its value as a personal retreat and resale enhancer. Gone are the days of garish tile and fuzzy toilet seat covers. Now bathrooms are as much about taste and style as the rest of the house. Homeowners want their bathrooms to be both beautiful and functional, and manufacturers have responded with many more choices in materials and fixtures. This book covers them all, with ideas for tiny half-baths, medium-size his-and-hers, and large luxurious home spas. Specifics on ventilation, waterproofing, faucets, showers, tubs, and more give readers the knowledge they need to create the bathroom they've always wanted. 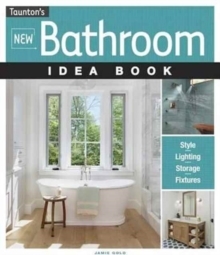 The New Bathroom Idea Book gives homeowners hundreds of ideas about how to make one of the most necessary rooms in the house one of the most beautiful.